We are all SO excited to have Azagoth’s story! Was he someone you were always planning to give a story to? Thank you! I’m excited too! And you know, I knew from the moment he appeared in a scene in Ecstasy Unveiled that he needed a story. I wasn’t sure when or how I’d do it, because when it comes down to it, the scope of his world is really small. 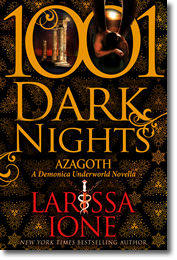 I knew I couldn’t get a full-length book out of him because he can’t leave his realm, so when the 1001 Dark Nights opportunity arose, it gave me the perfect chance to explore his unique world and keep the focus on the romance – not on an involved outside plot. It’s funny though, because even without a huge world, his book still turned out to be twice as long as my usual novellas. Yay! Azagoth and Lilliana are such an amazing couple and I adore them. Was there ever an idea for a different heroine or did you always have Lilliana in mind? I’ve had Lilliana in mind for a year or so…not long. She started popping into my head while I was working on Reaver. I wish I’d included her in Reaver’s book, but she at least got a mention in the Reaver Christmas story I wrote for a freebie on my website. But yes, I’ve had her in mind…at least, I had her character in mind. I wanted Azagoth to have someone who was being forced to be with him, mainly because he wanted someone willing. Poor guy has been so lonely, and all he wants is a female to share his life with – so naturally, I have to give him Lilliana, who doesn’t want to be there. At all. Will we get to visit more with Azagoth and Lilliana and the Unfallen? It’s such a fascinating new aspect to the world. Thank you! And yes, you’ll see more of them. I’ll be giving Hades his own story next year (It’ll be a 1001 Dark Nights book!) so we’ll be revisiting Sheoul-gra for sure, and a certain Unfallen angel you’ll meet in Azagoth with get to fall in love! You’re amazing at writing the damaged hero. From Wraith to Reseph and now with Azagoth, we always want your guys to get their happily ever after. Do you find it hard to give the reader the perfect balance of toughness and vulnerability with that type of hero? Although you primarily write paranormal, you do have a contemporary out: Snowbound. I read it and really enjoyed it…any plans to do more contemporary work? Eventually, yes. I’d like to write a sequel to Snowbound – Todd’s story. I enjoy writing contemporary, and right now that’s what’s really hot. But I’ve got to get some other stories out of my head before I can get back to contemporary writing! Your ACRO series with Stephanie Tyler is also another amazing series. If you could choose one other author to work with, dead or alive, who would it be? I know you’re a huge Star Trek fan. If you could be in one episode, what would it be and who would you play? Do you have any writing rituals you totally have to do when you’re writing? You’re a huge animal lover and are amazing with calling attention to animal issues within the world. Has anyone ever named a pet after one of your characters that you know of? Yes! Every once in a while a reader will tell me about their pets and how they named them after characters. Sometimes they send pictures! Shade, Wraith, and Ares seem to be popular names, as well as Gem and Sin. It’s awesome, because as you said, I’m a huge animal lover. We’ve seen some of your amazing pictures from your Europe trip. Do you have a favorite part? Oh, gosh…all of it! This most recent trip has been one of the best of my life, and I’ve done a LOT of traveling. I guess what stands out on this particular trip is our time in Bruges. I’ve been in several places in Europe multiple times, but this was my first time in Belgium. I wasn’t sure what to expect, so I didn’t think I’d love it as much as I did, but seriously, I could move to Bruges. Around every corner was another “OMG, wow” moment, the people were nice, and the food was awesome. The laid-back way of life was charming, and the canals and houses were gorgeous. I also VERY much enjoyed Paris with the book tour group. We had wonderful company and hung out with amazing people. This really was a trip of a lifetime!